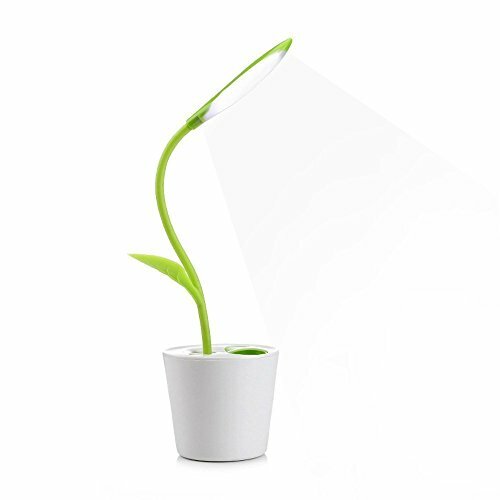 Creative New Design ❤ This Style Desk Lamp can give a natural and fresh feeling for your reading room because of the shrub-like design. What's more, sampling desk lamp with pencil holder can be used in home, office, school etc. Soft Brightness ❤ Our desk lamp provides a pleasant and soft light for your eyes. You will not be dazzled or disturbed when you turn it on. Moreover, it has 3 levels light to satisfy your different brightness desires. Economical and USB Rechargeable ❤ With its eco-friendly system, this desk lamp consumes little energy, a full charge will allow you to use it for 5 or 15 hours depending on the level of brightness that you chose. Flexible Lamp Neck ❤ The neck of this lamp is 360 degrees adjustment, so it can be adjusted to different heights and angles in the way that you prefer. An excellent combination of lighting and decorating. 100% guarantee ❤ Dear customer, your satisfaction is very important！ If you are not satisfied the lamp after receiving the product, we guarantee a full refund for quality problems to ensure the best shopping experience.